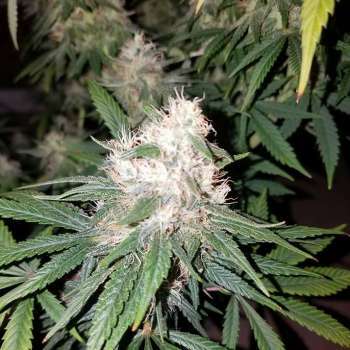 Here you can find a strain description about Pauls Purple Cookies and also some user-based reviews and infos directly from the SeedFinder (if available). You can also find the offers and auctions here if Pauls Purple Cookies cannabis seeds are on stock at MyCannapot right now. Purple Gorilla Cookies was started by my friend Tommy with a cross originated in the Bay Area between a Girl Scout Cookie Father and a Purple Gorilla Mother. The result is dense clusters with a pungent smell loaded with trichomes. The leaves turn from green yellow to magenta as pictured. The popular Girl Scout Cookie strain is known for its potency while the underground Purple Gorilla strain is known for having a heavy yield which is the reason they were crossed. The buds look like Girl Scout but are big like the Gorillas, the clubs are blown away by this strain and have passed as straight Girl Scout. Rare phenos have a grape berry smell and will start to turn purple the last couple weeks. I pollinated my Purple Gorilla Cookies female with a SFV OG male to add the twist and make it a monster bush. Buy Pauls Purple Cookies now at MyCannapot! There are no actual running auctions for Pauls Purple Cookies right now.